Ludwig van Beethoven, composer and pianist, was born in Bonn, Germany on December 15, 1770 and died March 26, 1827 in Vienna, Austria. He was one of the first successful freelance musicians, who rather than relying on the generosity of a patron or finding a steady position in the service of the church or nobility, instead earned his living from private teaching, composition and performance. He is best known for his larger orchestral works, especially his nine symphonies. Although, technically classified as a Classical composer, he stands at the end of the Classical Period (1750-1825) in music and is often cited, especially in his later works, as being the first composer of the Romantic Period (1825-1900). 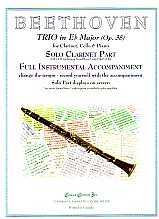 Beethoven composed two Trios for Clarinet (with an “alternative” violin part), Cello & Piano: Op. 11 in 1897 and Op. 38 in 1803. The 3rd movement Theme & Variations of the Op. 11 Trio uses the theme Pria ch’io l’impegno (Before I begin work) from Joseph Weigl’s (1766-1846) Opera L’amor marinaro (1797). He based Trio Op. 38 on his own Septet in Eb, Op. 20 (1799-1800, for Clarinet, Horn, Bassoon, Violin, Viola, Cello and Bass.